Kuranda beds sent us one of their Bunk beds! Yes, I said bunk beds for a dog. This is great! They are perfect for our females when they have pups. When the mother needs to get away she can jump on the top and the pups can't bother her. If you are looking for a sturdy, dependable dog bed be sure to read this review. The Kuranda beds are extremely well made and easily put together. You can use them inside or outside, whichever you and your dog prefer. The bed frames are made of a patented poly resin, furniture grade, co-extruded pipe. The outer layer of the frame is glossy and able to stand up to different weather conditions. You have several choices for the bed material. You can choose from heavy duty vinyl, textured nylon, outdoor mesh, or smooth nylon. Each one has different benefits. The beds come in single or the bunk bed style. The bunk bed style saves room if you have more than one dog. You can also choose from several sizes. Kuranda beds are recommended for their orthopedic design. They work well for dogs with hip and joint problems. These beds are super for larger dogs who need the extra comfort for their hips and joints. The beds have other healthy benefits for your dog, such as keeping them up off the cold floor and of course allowing air to circulate underneath when it is hot. You can also place a pad on the bed for extra comfort. Your dog can get sick from digesting the stuffing from ordinary “pillow” type dog beds. The Kuranda Bed is the only genuinely chew proof bed available. With choices of the Poly Resin Bed or the sturdier Aluminum Beds, there hasn’t been a dog born that we couldn’t build a bed for. This is why the Kuranda Beds are far and away the choice of professional Kennels, Shelters, Rescues & Breeders. We are going to use ours on the back deck over the summer. This way the dogs will be able to join us when we are sitting out back enjoying the weather. You can see in one of the pictures our cat decided to try out the Kuranda bed. The Kuranda beds are easy to clean. I just brush any loose hair off, and can quickly wipe down the frame and actual bed. This also makes them perfect for kennels, shelters, rescues and doggy daycares. You can find more information on the Kuranda website. We highly recommend the Kuranda Dog Beds! I am actually thinking they might be great in our kennels outside. Thanks for stopping by today. 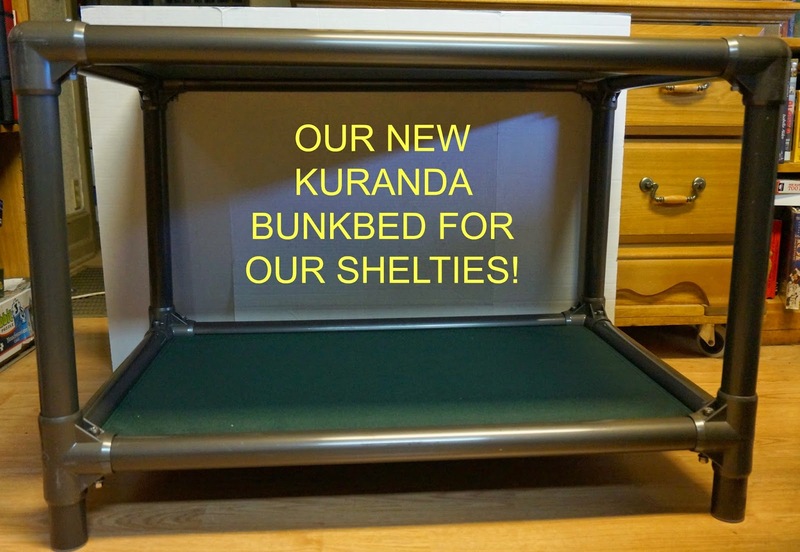 Be sure and leave a comment or share our post about Kuranda beds with your friends!